1,200 respondents, comprising representatives of the total demographic population above the age of 19, were surveyed. Data collection was done via face-to-face interviews. Almost 8 out of 10 (80%) respondents visited the Government websites in the past 12 months of the financial year. More than 90% of the respondents who visited Government websites were satisfied (rating of 4 and above – out of a scale of 6) with the usefulness and the ease of finding & understanding the information provided on the websites. 8 out of 10 (83%) respondents, who have visited Government websites, have transacted with the Government online using e-services in the past 12 months of the financial year. The remaining 17% who did not transact online using Government e-services mostly indicated they did not find the need or they preferred human contact in completing their transaction. 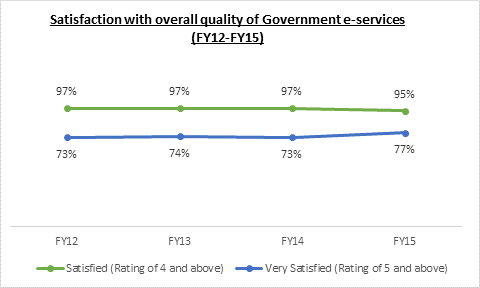 9 out of 10 users (95%) were satisfied (rating of 4 and above – out of a scale of 6) with the overall quality of Government e-services, while 77% were very satisfied (rating of 5 and above – out of a scale of 6). More than 90% of the respondents were satisfied (rating of 4 and above – out of a scale of 6) with the ease of completing the transactions and the adequacy of the information/instructions and support provided for using the Government e-services.